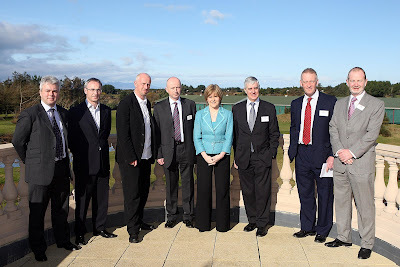 SCOTTISH Cabinet Secretary for Health and Wellbeing Nicola Sturgeon reinforced the Scottish Government’s commitment to the regeneration of Irvine Bay in Ayrshire when she addressed Irvine Bay Regeneration Company’s first Annual Public Meeting today (Tuesday 18 March 2008). 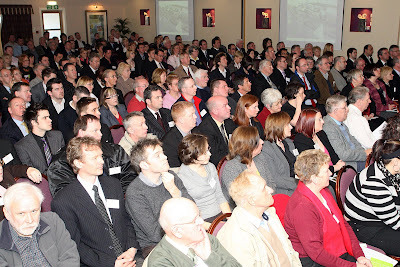 The meeting, the first public meeting Irvine Bay Regeneration Company has held since it was established just over one year ago, was attended by over 300 local residents, businesses, community groups and officials at the Gailes Hotel, Irvine. The regeneration of Irvine Bay is set to bring new investment to five of North Ayrshire’s towns. Irvine Bay Regeneration Company is focused upon creating physical and economic improvements to the towns of Irvine, Kilwinning, Ardrossan, Saltcoats and Stevenston that will create new job opportunities, improve the quality of life and provide opportunities for future economic growth. Cabinet Secretary for Health and Wellbeing Nicola Sturgeon said: “The Scottish Government is committed to the continued regeneration of Irvine Bay. We are working closely with the regeneration company as they finalise the exciting plans for the area. At the meeting Speyroc Ltd was announced as the preferred developer to create prestigious modern office accommodation at Annickbank on the edge of Irvine (see artist's impression above). Patrick Wiggins said: “This development will stimulate business and employment, creating a valuable asset for Irvine which will attract interest both from existing companies wishing to expand and from new companies wanting to set up in the area. Speyroc managing director Alexander Haig said: “Research has shown a shortage of smaller, new office units available for both sale and lease in the area. The space has therefore been designed to be flexible both in terms of the size of tenant and the fit out required. Over a number of years the development will deliver around 8,000 sq m of office space on this six acre site. Only last week Irvine Bay Regeneration Company announced Urban Splash, one of the UK’s leading developers, as its preferred partner to deliver a £70 million development set to lead the regeneration of Irvine on the west coast of Scotland. The development is on an 11 acre site at the harbourside of the former Scottish New Town. A new community is planned consisting of some 300 homes, many affordable for first-time buyers, shops, leisure facilities and commercial workspaces, expected to create some 100 construction jobs and on completion around 160 permanent and part-time jobs. 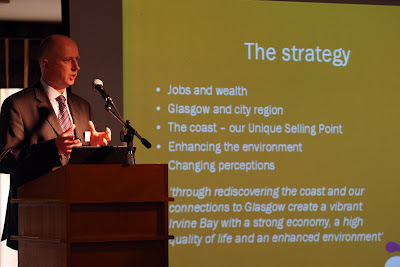 Urban Splash chairman Tom Bloxham addressed the meeting: “We think that by focusing on quality architecture, creating a strong sense of place and by working in partnership with Irvine Bay and North Ayrshire Council, we can deliver a mixed-use scheme that will help transform Irvine into a great place where people will want to live and work." As regeneration plans for the town centres in the area are being developed, Patrick Wiggins urged local communities to become involved in the consultation process: “We want to make sure that, as much as possible, people can make their own contribution to the improvements planned in their neighbourhoods. The Irvine Bay Regeneration Company, one of six URCs set up in partnership with the Scottish Government, has an ambitious twelve-year plan to breathe new life into the Ayrshire coastal towns of Irvine, Ardrossan, Saltcoats, Stevenston and the abbey town of Kilwinning. All five towns lie just 30 minutes drive from Glasgow, and fringe 14 miles of the stunning west coast of Scotland. All towns have railway stations and lie just 30 minutes from Glasgow and 15 minutes from Prestwick airports. Ardrossan is the ferry port to the island of Arran. 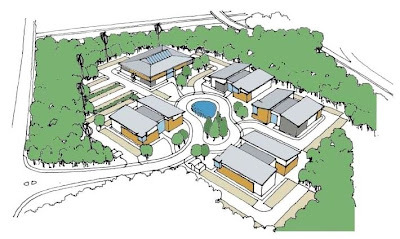 * The BREEAM standard seeks to minimise energy consumption and reduce waste in construction. This includes using materials supplied from renewable sources; using pre-fabrication to reduce on-site waste; specifying materials with a high recycled or re-used content; sourcing materials that are accredited from sustainable sources and which minimise the environmental impact of manufacturing; and, sourcing materials locally to reduce transport emissions. where Ayrshire business news breaks first!